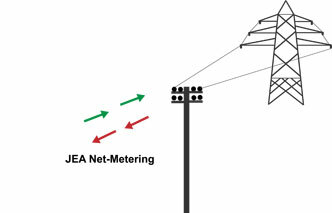 Click to learn more about JEA`s Net-Metering Program. TerraWise has built more Net-Zero Energy homes than any other builder in Jacksonville. However, this new concept in energy efficient home design is still relatively unfamiliar to most consumers. A Net-Zero home generates as much power as it consumers resulting in electric bills that net to zero cost for the homeowner. * To achieve Net-Zero a home must include the highest energy-efficient design, energy efficient appliances and a power generation system – typically solar in Florida. Homes designed by TerraWise are able to achieve Net-Zero more cost effectively due to inherently better overall energy efficient design and already very low HERS ratings. 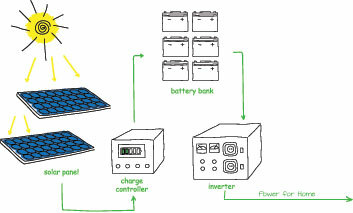 A state-of-the-art Solar Voltaic Power system is added to the home allowing sunshine to be converted to electricity. Learn more. Two electric meters are placed on the home – one tracking JEA electricity used and one tracking excess solar generated electricity returned to JEA's grid. Homes that generate excess electricity and send it to JEA's power grid receive an energy credit that helps offset their overall monthly JEA bill. Any energy credit received will accrue through the calendar year. If at the end of the year there is a remaining energy credit balance, JEA will pay the customer for the amount of credit based on JEA's retired Net Metering Policy. Click here for more details. TerraWise homeowners usually see a quicker return on investment when adding solar to go Net-Zero. * The highly energy efficient design standards require fewer solar panels than typical homes. 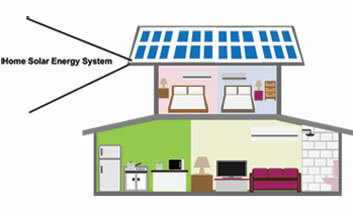 And, they enjoy low or net-zero energy bills every month for the 25-year life of the solar system. Additionally, Net-Zero Energy homeowners have the satisfaction of doing their part in lowering the carbon footprint of their home to reduce its impacts on the environment. That's real green building that pays real dividends to both the homeowner and the environment. The solar systems used by TerraWise Homes feature the latest technology providing feedback to a website so the efficiency of the Solar Panels can be monitored in real time and the energy savings displayed clearly for the homeowner. Contact us to learn more about how to take your new home dreams to Net-Zero Energy. *Net-Zero results can vary depending on many factors such as homeowner activity, weather conditions and changes in utility company solar metering programs as well as the Number of Solar Panels selected for the system. IMPORTANT DISCLAIMER: In Jacksonville, the Jacksonville Electric Authority (JEA) has changed their policy in 2018 with regards to their net-metering program. This will change the net-metering details which will make the overall benefit back to the homeowner different. We are still assessing this information and will change the information on this page to reflect that as soon as we are aware of the full details. Please contact one of our experienced staff members for the latest information on this.